Developing music vocabulary is important for all budding musicians! 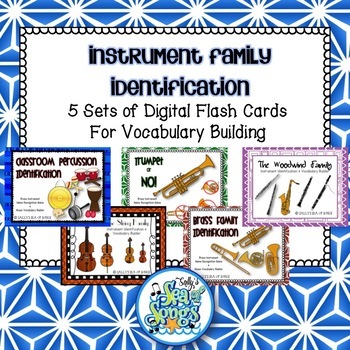 This bundle contains five separate PowerPoint flash card sets that will help teachers present and practice identifying the instruments in each family by name. These digital flash cards are intended for display on a large screen or interactive whiteboard. No prep needed! 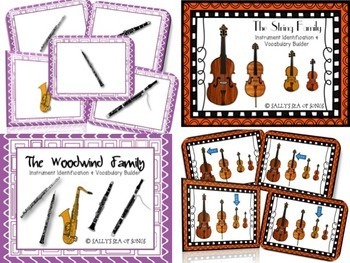 String Family - includes on violin, viola, cello & double bass. Woodwind Family - includes flute, clarinet, oboe, bassoon & saxophone. Brass Family - includes trumpet, trombone, French horn & tuba. 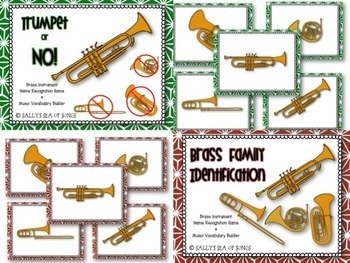 Trumpet or NO Game - beginner game that focuses on differentiating between trumpet and the other instruments in the brass family. 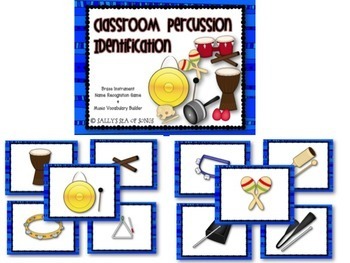 Classroom Percussion - includes 17 instruments commonly found in elementary music classrooms. Note that this is NOT orchestral percussion instruments. Directions for use, as well as additional flash card game directions, are included with each set. *Bonus* PDF versions of each set have now been added!